I guess this is the most famous cracker recipe in the Indian Food blog circuit. The original recipe was shared by Supriya of Redchillies, which went straight to Soma’s kitchen. Somehow Sharmila spotted it there. Immedieately she made them and tempted me enough with her gorgeous pictures to enter the kitchen with all the necessary ingredients. Uff that’s a long chain, (almost like Arusuvai) linked with one single recipe. But you might think, whats so great about these that so many people cant stop making and baking and praising them? Well the answer would be please try it yourself…especially if you are a fan of onion pakoras. Even if you hate onion pakoras like me you would find these little disk from heaven absolutely delicious. It tastes even better just out of the oven…all that onion-y flavour merged with the heat from green chillies and the freshness of coriander leaves…is simply sensational. This has become very famous among friends also. Some of them even come straight to the kitchen asking for more. We generally eat these with roasted tomato and coconut chutney but tastes great even with ketchup. Before I get into the recipe here is a quick reminder of the ongoing Arusuvai Friendship Chain. The pass-it-on ingredient game has already started. HERE is the link for all of you who wants to participate. Slice the onion very fine in half moon shape. Chop the chillies as fine as possible. Mix flours, salt, sugar, baking powder, soda, sesame seeds, chillies and half of the chopped onions in a big bowl. Add the curd and oil. Mix and make a dough (if required add water. Do this very carefully by adding a spoonful everytime). The dough would be thick. Knead for a couple of minutes. Cover and keep aside for 30 minutes. Preheat the oven at 170 C and line a baking tray with greased foil. Pinch small balls from the dough and place on the foil. Flatten with the back of a bowl. Poke a few holes with fork. You can also roll it out as a thin sheet and cut round disks with cookies cutters. Bake for 30 minutes or till the sides turn light golden brown. The marvelous savory low fat snack is ready enjoy with any chutney or sauce of your choice. The original recipe calls for butter and all-purpose flour. But I twisted it to make mine a little healthier so that I can keep on munching on these J without guilt. You can experiment with the flavour. Sharmila has added kasuri methi. I once flavoured it with oregano and also used red chili flakes instead of green chillies. 3. To sujana's Celebrating Regional cuisine. onion bake. onion cookies, Indian baked snack, Indian bakery snack, savory cookies, eggless bake, salted bake, best ever baked cracker, baked starter, low calorie starter, low calorie snack, between meal healthy snack,low fat snacks, appetizer, baked onion biscuit, savory biscuit, nipattu, nippattu, Bangalore bakery items, baked goodies, savory baked crackers, how to bake crackers, how to bake biscuit, how to make salted cookies, best ever onion cookies, perfect party starter, perfect cracker recipe. oh that looks crunch and spicy loving it! I love Nipattu but never made it at home and that too baked...this recipe is bookmarked! that looks quite tempting with onions and chillies! I'm going to make these RIGHT now. My mouth won't stop watering, I didn't even read the recipe (just ingredients! )have to try this out. and you said baked, not fried? can it get any better? 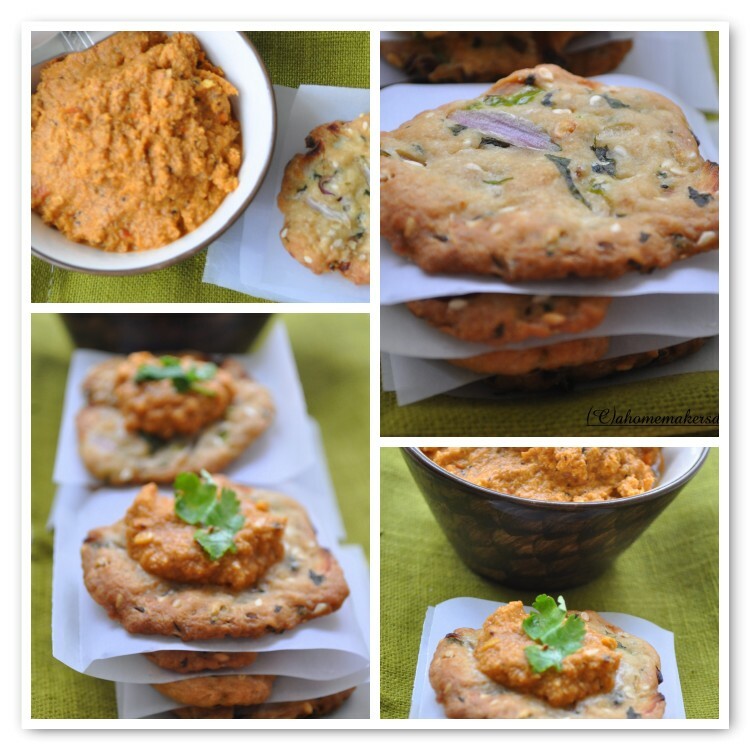 These look really fabulous and yummy...sound similar to thalipeeth(marathi)taste ...will surely try...bookmarked. looks delicious...and Im extremely tempted to try making crackers at home...great pic too. They look absolutely fantastic. I love your chutney too. I have this bookmarked for a long time. Time to give it a try. Yup.."no one can eat just one!" I often make these (actually I have this in my draft) as I don't have much of a sweet tooth. love the rich golden color n the crispy look of the nippatu..I am going to bake a batch for myself now..lol! 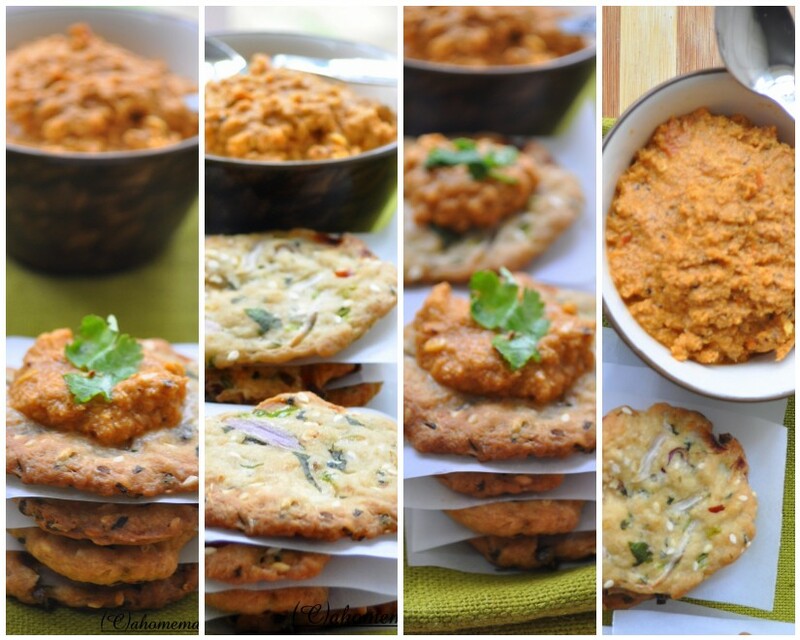 Recipe is very nice,very healthy way to do the crackers and lovely pics too..
hi. I had read all the posts on Nippattu and I like ur little tweak of making it more healthier, nice clicks. This is one of my favorite snacks Sayantani! the Chutney on top of it makes it look even more tempting. And true.. u can't eat just one of these, certainly not when presented the way u have!! Something baked and Indian should be perfect! Lovely looking Nippatu!..classy shots too! Sayantani, just now I discovered about the searches which land in my blog...straight to the post..'With love from Sayantani'...do you know the key search word?? "Sayantani" :D :D that too out of 62,000 results ;-)...the post link comes 8th...interesting na?? Hope many would get to know abt the chain and jump in soon.. I like the idea of using oregano & chilli flakes. Have a surprise for you in my space..do check out..
O ma ki shundor dekhte e gulo. I have had something similar in Bangalore, but dont remember the name. I am going to try making these, S. Jar e bhore rakha jaye? Oh, I couldn't see this! I'm hungry!! Never heard about these onion crackers but I love onion. I'm sure I would love them! wat a gorgeous dish..recipe sounds fantastic..
Never heard of these, but you have me so tempted...I'd better bookmark these. Made these yesterday---they vanished in minutes! Just wanted to thank you for the recipe---these will be featuring in my kitchen regularly. I added some kasoori methi to them...also I think I need to make them thinner next time, for extra crunch. excellent snack! These are "unstoppable" :-) we ate and ate and ate and then realized how much we ate. and as you said, the spices and the flavorings can be varied to give a totally new taste. I had to giggle, these crackers come from a very long pedigree of illustriuos bloggers - they HAVE to be good. I was hunting for quick and easy starters for the Christmas parties coeming up, will def give 'em a try. like the fact that they are baked and low fat! Thank you everybody for thsi over whelming appreciation. am delighted so many of you liked it. @GB and Sweet artichoke, welcome to the Nippattu lovers association. glad that you tried. thanks Lavina. yes knead it as much as possible to get a smooth nippattu. Wow looks yummy!!! Can't wait to try this.